Deborah in "crispy autumnal South Africa" recently commented on my bookmark post asking for ideas on finishing them. She gave me a GREAT idea for a blog post and here it is. I am not an expert by any means, but will give you all some ideas, and maybe some other folks will comment on what they have done and we will all learn something. 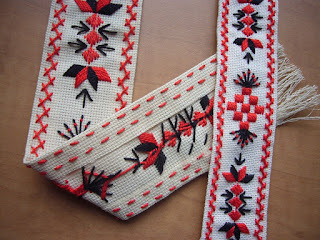 This is the Hungarian Embroidery bookmark that got Deborah to ask her question. The edges were folded over with enough area folded on the back to be caught by the herringbone stitches on the front. The double lines of stitching on the back is the back side of the herringbone. For extra security you could use your sewing machine to do a small zig-zag stitch on the long sides before folding them over and doing the herringbone. I did this with the small one (could not get a good picture since the sewing thread matched the bookmark and my stitch was small). I did have to remove some of the zig-zag at the top and bottom areas that are fringed in order to get it to fringe though! I suppose you could also do it by hand similar to what you would do to keep your fabric from ravelling while stitching on it, but I always use my machine. Also perhaps surging the sides before folding over. I would do this after the stitching is done and before the herringbone to make sure you leave enough fabric to catch on the back with the herringbone. This next bookmark is an EGA Petite Project on blackwork. The edges are nun stitched. This is a nice way to finish a bookmark and I have used it for others as well. 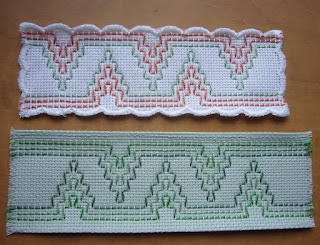 My third example is some Swedish weaving I did on purchased pre-finished bookmarks. By counting the usable space on the bookmark and comparing it to my design I was able to make it fit. It was a tad trickier on the scallop edged one, but it still worked. No finishing required on these since the scalloped edge and the folded edge on the green were done already. 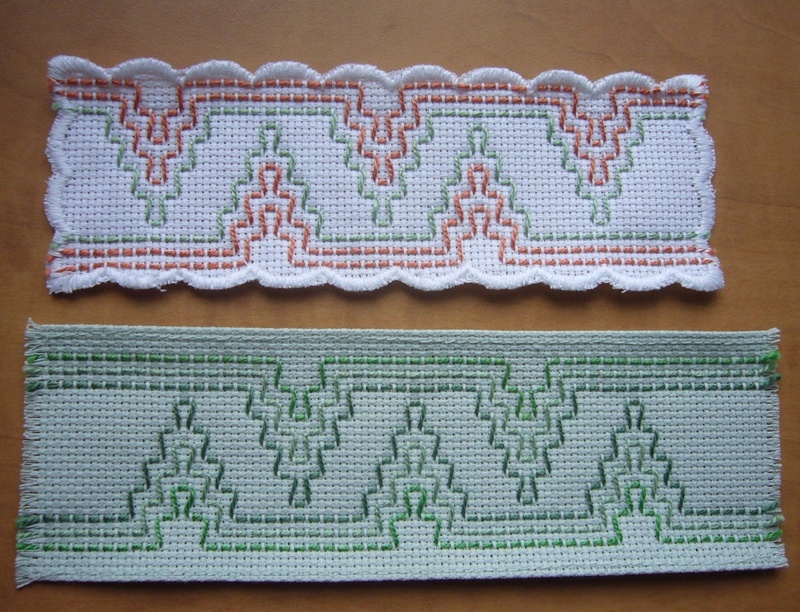 I do not recall the maker of the top one, but the green one is by Charles Craft and comes in other colors. Both are 14 count aida. 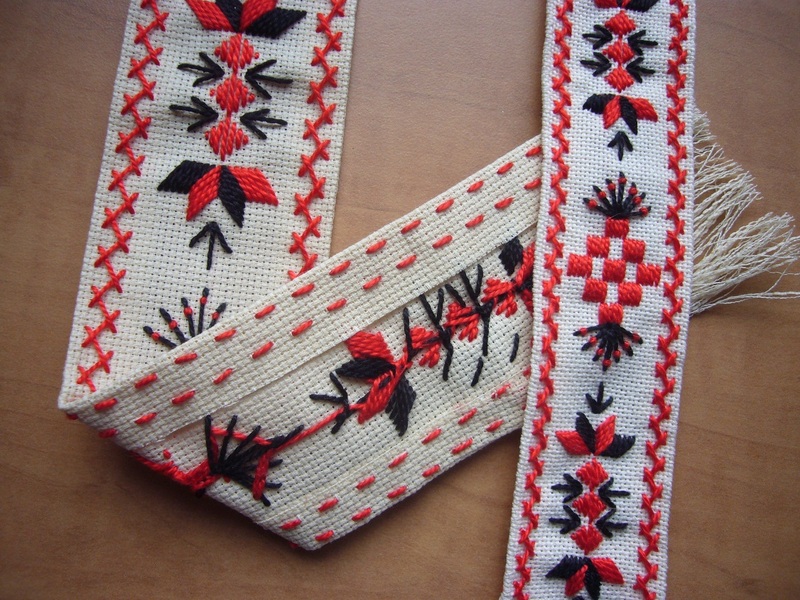 This is another Swedish weaving design. for this one I used my sewing machine and did small straight stitches around the four sides and then cut the fabric outside the straight stitches to the length I wanted the fringe and then fringed it. These are all the bookmarks I could find at my house and I think it covers all the ways I have finished them. There could be other ways, but hope this helps some of you or gives you some ideas. Please share with the rest of us, if you want!